Bishop Filipe C. Teixeira (right) of the Immigration Pastoral Center says the Pledge of Allegiance Wednesday during Immigrants’ Day. Zayda Ortiz, a medical secretary from Malden, sat across from her state representative Wednesday and described a 14-year-old Guatemalan boy she knows. A bright teenager who immigrated to the United States as an infant, his grades have plunged since President Trump took office. 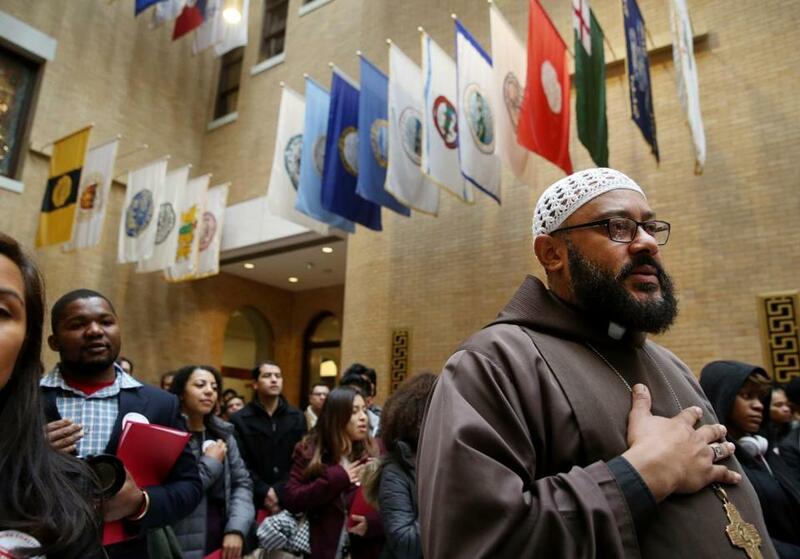 Ortiz was among dozens of advocates for immigrants who fanned out around the State House Wednesday during the 21st annual Immigrants’ Day to garner support for the Safe Communities Act, sometimes referred to as the “sanctuary state” bill. The legislation would prohibit local police from asking about a person’s immigration status or arresting someone solely because of their immigration status, and it would forbid county sheriffs from deputizing officers to act as immigration agents. It would also forbid the use of any state resources to create a registry for Muslims, one of Trump’s early campaign proposals, and would prohibit law enforcement from holding immigrants solely to honor an ICE detainer. The bill, cosponsored by state Senator Jamie Eldridge and state Representative Juana Matias, has the backing of 92 legislators, momentum that advocates see as a response to Trump’s immigration policies. Eldridge, a Marlborough Democrat, has tried several times over the last six years to get the bill passed. “I’m more optimistic than ever,” he said Wednesday. Large crowds typically gather for Immigrants’ Day to push for issues such as better access to health care and in-state tuition for immigrants. 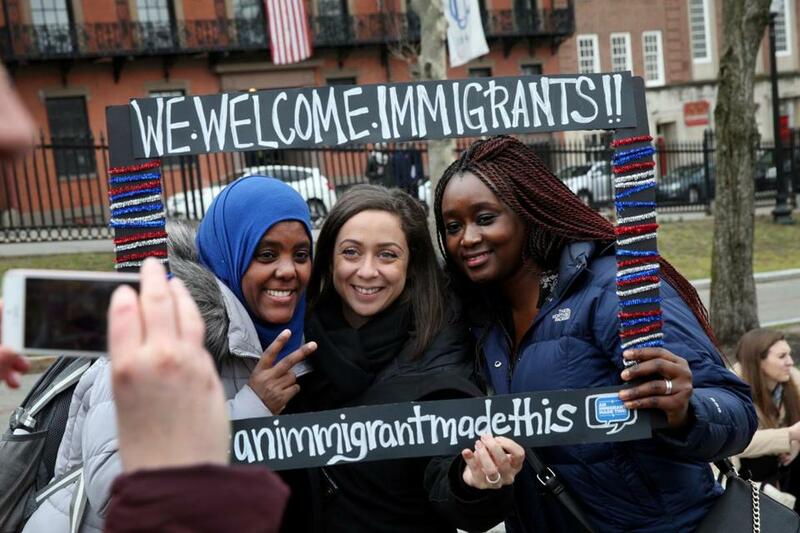 On Wednesday, leaders of the Massachusetts Immigrant and Refugee Advocacy Coalition said they had never seen so many supporters gathered in the Great Hall of the State House. Hundreds squeezed inside to listen to speaker after speaker talk about the history of immigration in the United States, many of them decrying Trump’s policies. One of the speakers, Secretary of State William F. Galvin, angrily compared recent immigration arrests with the actions of 19th-century slave masters bent on bringing back runaway slaves. “The behavior of this administration is typical of a totalitarian regime,” he said, drawing cheers. 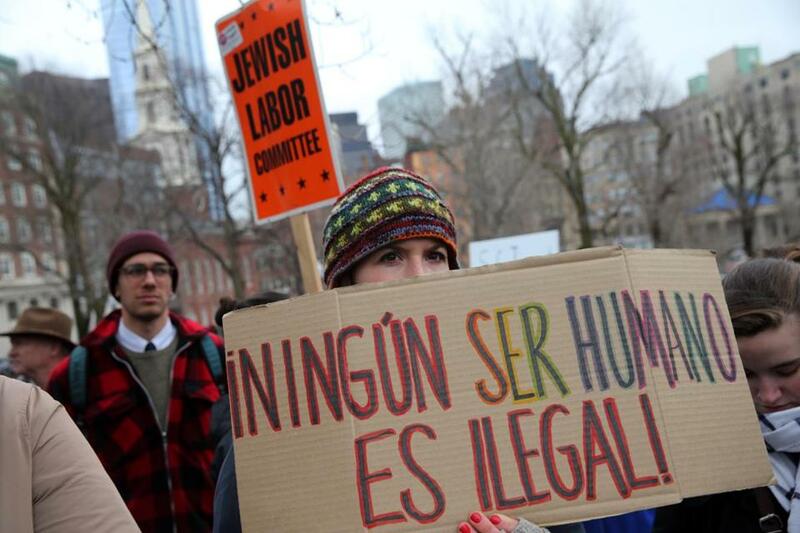 After the speeches, a peaceful crowd of about 100 people hoisted signs supporting immigrants in a rally on Boston Common. The scene moved Clara Perdomo, a 57-year-old immigrant from the Dominican Republic, who came to Boston five years ago to find work. Still, passage of the bill is not certain. House Speaker Robert DeLeo has not stated whether he supports the legislation. He said through a spokesman Wednesday that the bill will be reviewed as it goes through the process. And Governor Charlie Baker maintained his opposition to making Massachusetts a sanctuary state, arguing that communities should decide whether to adopt the status, which typically means that a municipality does not allow its law enforcement agencies to aid in immigration enforcement. Birchat Kedir of Ethiopia, Olivia Meyerhoffer of France, and Mariama Cire Sylla of Guinea (from left) at the rally. Advocates for the bill said the legislation is not meant to protect criminals from prosecution or to forbid local agencies from sharing immigration information with ICE. Ortiz tried to stress those points during her meeting with Donato, who has not signed on as a cosponsor of the legislation. “I just really think that the Safe Communities Act will ensure that people have due process,” she said. Donato gave no answer about where he stood. Instead, he described his own background as the son of Sicilian immigrants, and expressed sympathy for the boy Ortiz described. “We don’t want to make it so that any immigrant is intimidated as they walk the streets,” he said. He then told her the House leadership planned to discuss the legislation, gave her his cellphone number, and asked her to bring the boy to the State House so he could meet him. More than 1,000 people were expected to visit Beacon Hill over the course of the day, celebrating the contributions of Massachusetts' 1 million foreign-born people to the state's economy, culture and civic life, and to advocate for legislation and budget items that are priorities for our foreign-born residents.